July 21, 2017 Art on Armitage closed as an art venue in Chicago's Hermosa Community. 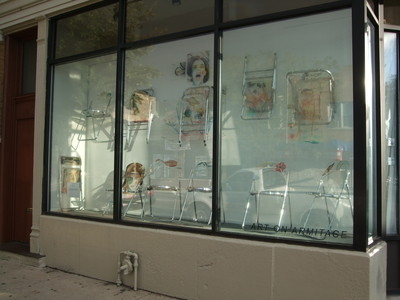 Chairs are utilized as a structure for painting. In conjunction I have developed a paint that fuses into plexiglass. This enables me to replace original chair components with painted panels. Narrative situations are achieved by extending panels beyond the chair frame when mounted on the wall. Juxtaposed free standing pieces become sculptures unto themselves. When all elements are combined an installation results, this one entitled "Emotional Venues".